Summer’s finale is fast approaching—Labor Day weekend! While we’re slightly in despair over summer ending, the idea of packing a suitcase full of warm-weather looks has us eager to celebrate the long weekend in style. As a swan song to the sunny season, the holiday weekend is a critical time to give denim cut-offs, colorful bikinis, and in-season florals their final moment in the spotlight whether you’re planning a nearby jaunt at the beach, touring a new city, or kicking back at a friend’s lake house. Likewise goes for warm-weather accessories like cute sandals, straw hats and bags, and vibrant jewelry—you can totally keep your favorite sunnies and sneakers in rotation come fall. Wherever you’re headed this Labor Day, we’ve curated four fashionable outfits to simplify the packing process and ensure your look is on point all weekend long. From a casual-cool barbecue bash look to a feminine pool party ensemble, inspiration lies ahead. 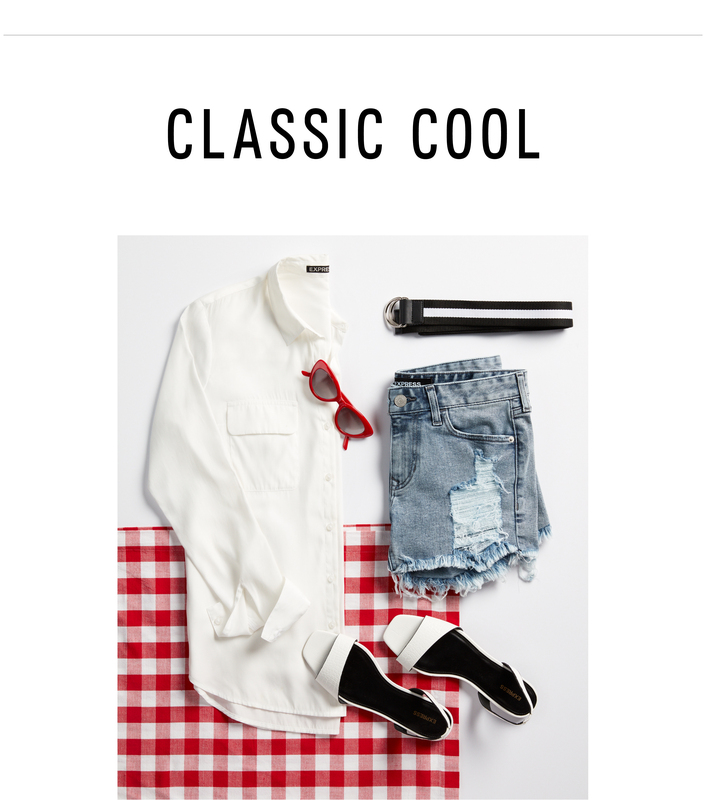 An ode to Americana style, a classic white button-down and cut-off shorts is quintessentially summer and perfect for a laid-back barbeque, beach hang, or backyard party. For a fashion-forward spin, punctuate the look with red cat-eye sunglasses, a sporty belt, and optic white sandals. If a pool party or seaside affair is on the agenda, steal the spotlight in a floral-print romper atop a red-hot bikini (whether you take a dip or not). A so-now straw tote, easy slides, and playful earrings give the feminine look a party-ready spin. GET THE LOOK: Rhinestone Tassel Drop Earrings, Floral Surplice Bell Sleeve Romper, V-Wire Bikini Swim Top, Slide Sandals, Straw Bucket Bag. GET THE LOOK: One Eleven Scoop Neck Tank, Brow Bar Round Sunglasses, Low Rise Raw Hem Distressed Midi Shorts, Stripe Full Button Up Shirt (tied around waist), Steve Madden Lancer Sneakers. Labor Day weekend is a perfect time to get outdoors and explore. 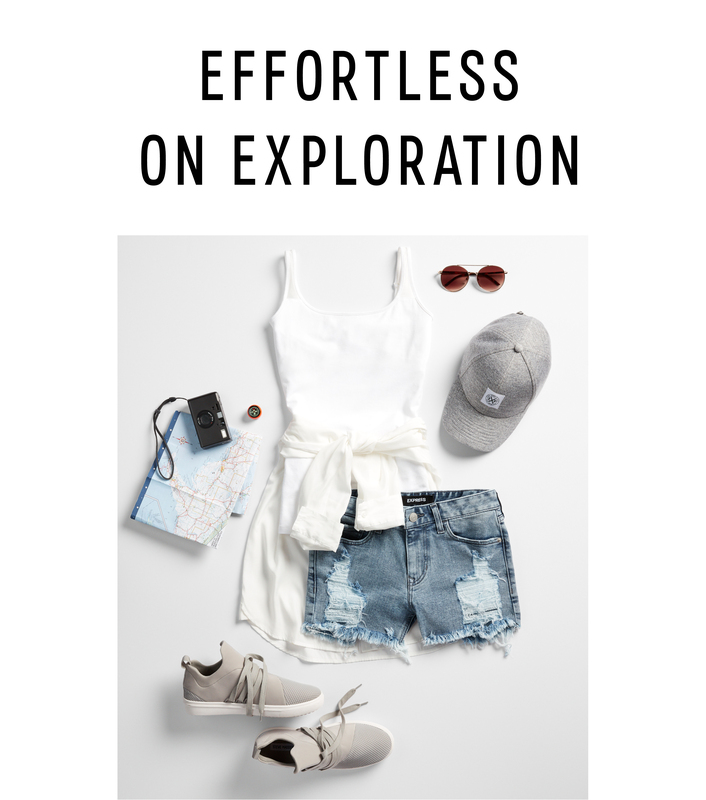 Whether you’re touring a bucket-list locale or discovering a new hiking trail, a white tank top and jean shorts are the epitome of easy-chic. Define your shape by wrapping an extra shirt around your waist and style in mesh sneakers, a cap, and wire-frame sunglasses for a sporty finish. What better way to bid summer adieu than with a colorful bikini? Whether you’re setting sail, relaxing in a cabana, or picnicking on the beach, an oversized button-down serves as a sophisticated coverup while studded slides, a straw tote, and wide-brim hat are glamorous accents. GET THE LOOK: V-Wire Bikini Swim Top, Stripe Full Button Up Shirt, Studded Slide Sandals, Metallic Round Straw Tote.